Please complete our wedding information & agreement in order to book your date. We can accommodate any size Bridal party, however we do need to know in advance. Please contact us as soon as possible with any questions that you may have! 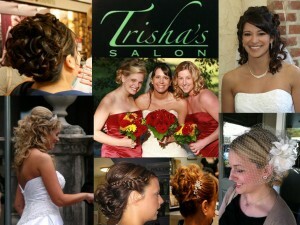 Here at Trisha’s Salon we know that you want your day to be perfect. You have most likely been planning for months, and we want you to be relxed while you are pampered here. Here are some pointers to keep your appointment as smooth as possible. -Book a hair style trial with your stylist at least a month prior to your wedding day. Bring photos of hair and make-up styles, your hair accessories, and any concerns or questions along with you! -Be sure to bring any head peice, veil, or hair jewelry that you need for your style. -Where a button down top for easy changing later; advise your bridesmaids to do the same. -Please arrive with your hair washed and dried if you are planning to have an up-do style. -If you are having your make-up done, please arrive with a freshly washed and moisturized face. -We will provide complimentary beverages for you and your wedding party on the day of your wedding, however you are welcome to bring additional items. -Take a few deep breaths, sit back, and enjoy every minute of your special day!